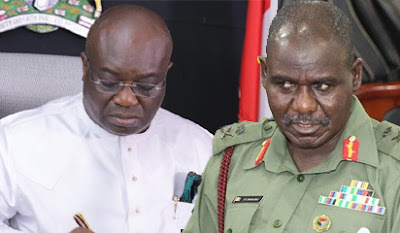 The Army in a statement signed, last night, by Director, Army Public Relations, Brigadier General Sani Kukasheka Usman, asked the public not to misconstrue the statement of Governor Okezie Ikpeazu of Abia State, yesterday, to mean that the Army was totally halting the Operation Python Dance II in the South East, including Abia State. The statement read: ‘’The attention of the Nigerian Army has been drawn to some stories in the media that it is withdrawing its troops from exercise EGWU EKE II, crediting such information to Abia State Governor and the General Officer Commanding 82 Division Nigerian Army. This is not true. The Nigerian Army wishes to enjoin members of the public to disregard such rumours. ‘’For the avoidance of doubt, the Abia State Governor in his speech stated that “there will be gradual withdrawal of soldiers on the streets of Aba and Umuahia from tomorrow. ‘’This should not be misconstrued as withdrawing of troops earmarked for Exercise EGWU EKE II. The General Officer Commanding 82 Division has not said such thing. ‘’Consequently, we wish to state that exercise EGWU EKE II is commencing tomorrow as scheduled. Commanders have been instructed to ensure that all hands are on deck to commence the exercise to its logical completion. ‘’We wish to state further that the successful completion of the exercise will dovetail into the various states security outfits till the end of this year. ‘’Members of the public, especially in the areas where the exercise will take place, are please enjoined to go about their lawful businesses. We wish to also state that we would not allow any individual or group to jeopardize the conduct of the field training exercise through unlawful or criminal activities. ‘’Hoodlums and criminal elements are once again warned to be law abiding and not cause any breach of peace. ‘’We, hereby, reiterate that our troops would conduct themselves in the best professional manner, abide by the Rules of Engagement and Code of Conduct in line with requirements of the Constitution of the Federal Republic of Nigeria. Governor Ikpeazu had earlier spoken amid reports of heavy shooting around IPOB leader, Nnamdi Kanu’s home in Umuahia, yesterday, with about four persons feared killed. This, however, could not be confirmed at press time.